“Eating” Up Some New Expressions! As you probably know, Chinese people really like eating and preparing delicious food. What you may not know is how many other uses for the word “eat” we have! And from this linguistic importance placed on food, comes some very funny slang phrases in Chinese. Let’s take a look! Literally, “吃醋(chī cù)” means “to eat vinegar”. Obviously, the flavor of vinegar is sour – just like the way we describe jealousy. 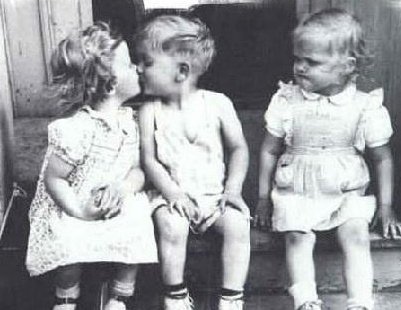 And what causes more jealousy than young love? Take a look at the above picture: the girl who is sitting on the right is definitely “chī cù” now. Don’t be jealous: she is just my friend! 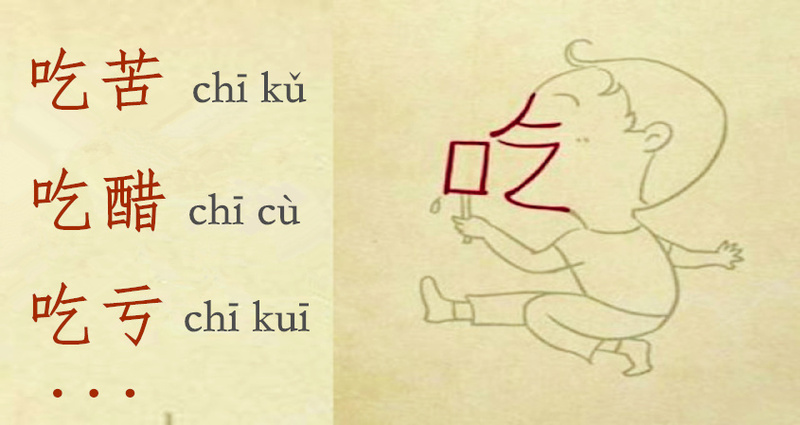 “吃亏是福(chī kuī shì fú),” means “a bad bargain is a form of blessing.” Many people write these words as fancy calligraphy and hang this phrase on their wall like the picture shows. A bad bargain is a kind of blessing: never be angry with your wife. Or, consider the phrase “吃哑巴亏 (chī yǎ bɑ kuī).” “哑巴（yǎ bɑ)” means a person who is dumb. So, the phrase as a whole means that someone suffered some form of loss, but is unable to talk about it for one reason or another (hence the “dumbness”). Be brave, and don’t always be forced to be at the passive position. The word “苦(kǔ)” refers to a bitter flavor. So, “吃苦 (chī kǔ)” means a person who endures hardship. Obviously, the picture shows two overly caring parents who will not let their kid “吃苦”. To endure hardship is a good thing for the young. Are you ready to “eat” the new phrases you learned above? Have you already eaten some of them? Do you know any other slang that uses “吃”?